Game 1 starts tomorrow at 1pm. I know some of the games this series are at night but I am confident they will always have these day games in the Series. Not having day games in the Series would be like having lights in Wrigley. It won't happen! Tiant- a Johnny Cueto clone- has me worried. All those different looks could give the Reds fits as bad as a Rookie slop throwing Lefty making his MLB debut inevitably does. Last edited by klw; 10-10-2017 at 02:38 PM. Red Sox don't have a chance without Jim Rice. Tiant just uses smoke and mirrors to get people out. Reds will figure him out quickly. With Gullett going in the first game this should be a Reds win. I would find a way to get Griffey's speed and OBP near top of lineup. Definitely ahead of Concepcion at least. Either way should be able to score some runs in game 1. Life has been busy so I apologize for not being able to do active threads for each game of the Series. Unfortunately we all know how the Series turned out with the Red Sox winning the Series 3 games to 3 with Fisk hitting the walk off homer in Game 6 to win the title for Boston. At some point they did move Griffey to #2 didn't they? 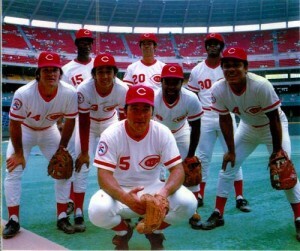 I remember Rose-Griffey-Morgan-Bench-Perez-Foster-Concepcion-Geronimo as the main order. Maybe that wasn't until '76? There was in 76 and Driessen had a big series. That is what I was hinting at.